Sandy's painterly style shows in these three scenes. 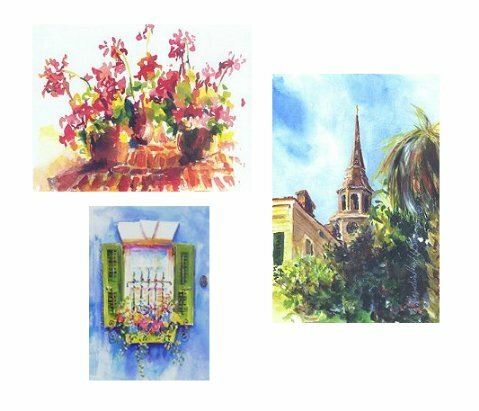 A native Charlestonian, "Sandy" Bennington' watercolors are a creative reflection of her knowledge and awareness of local architecture, as well as the interesting details in all facets of lowcountry life. Her intuitive talent makes her work to flow with warmth and feeling. The warm, bright colors employed in her paintings are an artistic extension of her own sunny personality. Whether sharing special time with family and friends, boating off the Charleston peninsula, crabbing in nearby marsh plough mud, or working in her Mount Pleasant garden, her traditional lowcountry life style has given the artist a special touch which results in the vibrant color and light seen in her artwork. Bennington has won awards from South Carolina Watercolor Society and is a member of the Charleston Artist Guild. Principally self taught, her art has been influenced by working with Charleston's nationally known portrait artist,Charles D'Antonio, and internationally renowned watercolorist, Skip Lawrence. The overlaying of various other aqua media to her watercolors has resulted in a painterly, almost impressionistic effect.